I've just blogged about creating a table for a calendar in SQL Server - here's how to do the same thing in Excel or Access. Whether you're creating a table in Excel or Access, the easiest place to start is Excel. Click and drag on the autofill handle shown to create a sequence of dates. It's often a good idea to extend this into the future, so your calendar is futureproof. Type a formula referring to the top cell, and copy it down. When copying formulae down, don't click and drag on the autofill handle; instead, double-click on it, and Excel will automatically copy your formulae down to the last date in column A.
Double-click with the cross shown to copy the various formulae down. In PowerPivot, choose this button on the Home tab of the ribbon. Choose to connect to Excel. Make sure you tick the box saying that your first row has column headers! Here we've chosen to call the imported data Calendar. 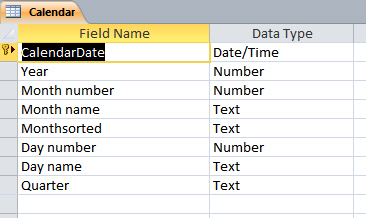 The disadvantage of using Excel is that you can't connect to the same table twice in a PowerPivot workbook (so if you have two date fields in the same workbook, you'd have to copy the Excel workbook and link to that instead for the second date). 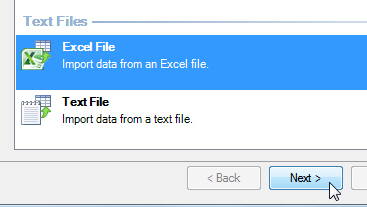 First choose to import Excel external data. Browse to find the Excel calendar workbook, and choose to import it into a new table. Access assumes the year, for example, is of data type Double, but it's actually an Integer. However, you could leave all the types as their defaults and set sensible defaults after importing the table into PowerPivot. It's probably a good idea to set the date column as your primary key, as this will check that you haven't inadvertently included the same date twice. 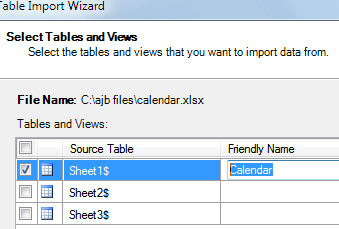 The calendar table in design view. Choose this option to import tables from an Access database.